Cranmore House with members of the Daly Family. This once lovely house was built in 1838 for Alexander Clendenning Lambert, who was an agent for the Knox family, and had connections with the Clendenning Banking Family. The house was designed in the ... style by architect George Papworth He had leased the land from Colonel Charles Nesbit Knox of Castle Lacken, which was near Killala. It had an imposing main entrance from Bowgate Street with service entrances from the Neale Road. The beautiful house had a drawing room, dining room, library, morning room and study and seven bedrooms with dressing rooms. There were kitchens and ancillary rooms in the basement. It also had a dome with gallery and extensive gardens. 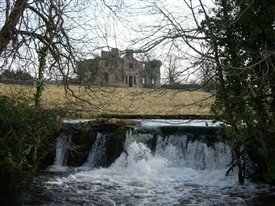 Cranmore House reverted to the Knoxes immediately after the Famine and was used as a dower house by Colonel Charles Howe Cuff Knox for his mother initially. The Knox family were originally from County Donegal and in 1778 William Knox married Elizabeth Nesbitt of Scurmore, county Sligo. 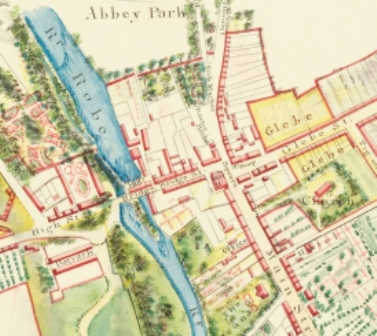 Their son Charles Nesbitt Knox married Jane Cuff, eventually heiress to the settled estates of her father James Cuff, Lord Tyrawley of Ballinrobe. 4. Philippa 1848-1921 lived at Cranmore House. Their eldest son (no 1 above) Charles Howe Cuff Knox built Creagh House around 1875. He was a Justice of the Peace (J.P), Deputy Lieutenant (D.L.) and High Sheriff of Co. Mayo in 1873 having a M.A. from Oxford. He was Colonel of the 3rd battalion of the Connaught Rangers and Captain of the 8th Hussars. Charles W. Cuff Knox (b 1870-1910), lived at Creagh House. He was a Major in the Rifle Brigade and died on 25th January, 1910 aged 39 years. There is a stained-glass window on the left side of the Church of Ireland (now the Library) in his memory. Henry Howe Cuff Knox (b 1871-1954), lived at Creagh House. Philippa, (no 4 above) their daughter contributed to the Association for the Preservation of the Memorials of the Dead, Ireland Journal for the year 1892 and to further publications up to 1910, see http://www.tcd.ie/Library/ where she records some of the gravestone from St. Mary’s Church of Ireland, Ballinrobe. Howe James Knox was Head of Household in the 1901, with 5 servants Bridget Stritch, (60 years) Cook, Adele Delmire (70), Ladies maid, Lillie Woods (25) Parlour maid, Jane Cook (19), Housemaid and Delia Finnerty (18) Kitchen maid. According to the Ballinrobe Chronicle the Lord Lieut. Earl Spencer was received at Cranmore on the 4th Sept. 1869. 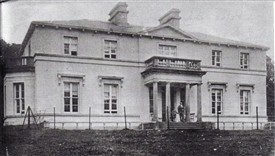 Many years later c 1920’s Cranmore House was purchased by the Patrick Daly, whose brother Dr. Peter practised medicine from there, and also held the post of workhouse Doctor. After the Workhouse (see No 3 Town Heritage Trail) closed he moved to London. Dr. Peter remembers Col. Knox and corresponded with him when there was a family bereavement c 1921. 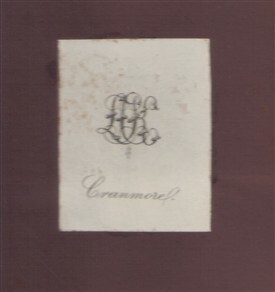 Cranmore House was then sold to the McCartan family in the 1940's. 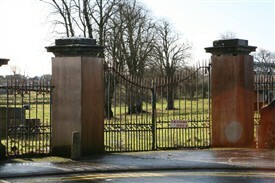 The gate lodge still remains standing close to the main entrance gates. In due course the house was sold by the McCartan family and the new owner removed the roof to avoid payment of the high rates (a form of property tax) in the early 1950's. Many of the beautiful trees were removed and sold. This entrance was the original entrance to a tower-house which was then extended as a Manor House and finally as a Cavalry Barracks. The gatelodge is still on the outside right of the gate and further along the street on the left side towards Main St. one can still see the cut stone coach houses with their high surrounding walls, occupied by Vet. Rory O’Neill’s and Kelly's practice. A harness room, laundry and dog kennels were also located here. A cobblestone yard suitable for horses was later covered over. Patsy Murphy of Cornmarket recalls playing in Cranmore as a child and observed a row of bells in the lower level kitchen used to summon the servants. This page was added by Averil Staunton on 19/01/2011.